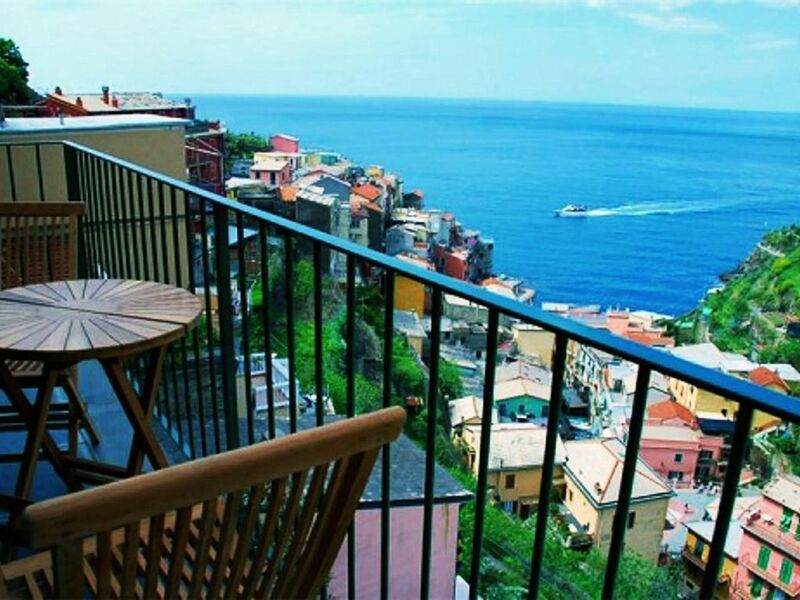 Manarola Vista Mare apartments is a small association formed by property owners who rent out apartments and rooms via the web. The property is situated in the historic centre of Manarola, a small town inside the 5 terre national park. Set in quiet and pleasant locations, by the seaside and a few steps away from the train station and 'la Via dell'Amore', the apartment has been recently renovated so as to offer maximum levels of comfort and exceptional value for money. Manarola Vista Mare apartments will welcome you in a warm and pleasant atmosphere. Wo We are: Manarola Vista Mare apartments is a small association formed by property owners who rent out apartments and rooms via the web. The properties are all situated in the historic centre of Manarola, a small town inside the 5 terre national park. Set in quiet and pleasant locations, by the seaside and a few steps away from the train station and 'la Via dell'Amore' , the apartments and rooms have been recently renovated so as to offer maximum levels of comfort and exceptional value for money. An amazing stay in Manarola!! Beautiful and open studio worked great for us. There’s a fantastic view and balcony. And Simone was responsive, resourceful and a gracious host. We had a rainy morning one day and the apartment was a great place to watch the weather and make a fantastic lunch. Totally recommend Simone and this apartment. A lovely Apartment with great views! Sitting on the balcony was just a beautiful experience with amazing views and it really was such a peaceful environment! My wife and I stayed at Studio Sciacchetrà in Manarola in August, 2016. We were incredibly happy! The apartment is a beautiful place to stay! The view of the town, hillsides and Ligurian Sea from the balcony is phenomenal! We spent many morning savouring coffee, afternoons having lunch or a glass of wine and evenings watching the incredible sunsets. The walkway directly below the balcony is a favorite stop for people taking pictures. The size of the apartment is spacious. The furnishings are very comfortable and stylish. The kitchen is excellent for cooking and well stocked with dishware, utensils and cooking gear. The amount of sunlight coming into the apartment is beautiful. The staff managing the apartment is very friendly and helpful. The apartment was spotless and well supplied with towels and grooming and cleaning supplies when we arrived. WiFi access was strong and always available. Nicolette, the owner was very helpful and friendly during our initial inquiries about the apartment. We highly recommend staying here. You will not be disappointed!!! I started working on our trip to Europe a year in advance. The Cinque Terre was our number one destination. When I found Nicoletta and Gualtiero's little sea room, all it became after that was "The Long Wait". They were quick with all replies and always with helpful information. Sending links for the park, paths and surrounding area. It is very cozy and the view can't be beat. Sat outside for hours when we weren't hiking or visiting the other towns. Met Nicoletta and Gualitero's wife once in their wine shop. Gualtiero was always around town and always greeted you like an old friend. One time we were heading back to our room and he took us to his dad's for a bottle of his homemade wine, where we met his Dad. You cannot go wrong staying here, pure relaxation . It was our vacation within a vacation. While this was out of their control, some of the easier trails were closed due to some horrible slides earlier in the year. I hope they get them opened soon, as I'd love to return and I already know where I'll be staying. Thank you for the wonderful four nights at your part of the world. This cozy apartment by the sea in Manarola was perfect for our 3 day stay in Cinque Terre. The owners were prompt in meeting us at a prearranged location and then helped us with our luggage to our accommodation. The apartment was clean and comfortable with a view of the sea and the colourful town of Manarola. It was like a picture postcard right in front of our eyes! The location was ideal for exploring all villages of the Cinque Terre and we enjoyed coming back to our apartment, sitting on our balcony with a bottle of wine and watching the sunset. Absolute perfection! We highly recommend this property to anyone planning a visit to Cinque Terre. Had a great time in Apartment Limoncino, it was clean and looked to be recently renovated. It is in a great location only seconds walk from the grocery store and not far from anything else in the village, nice to come home and not have to walk up the hill either. The owner was helpful and the people who manage the property at the travel agency were relaxed and easy to deal with. We absolutely loved the village and the local area and would highly recommend this apartment. Paul, Narelle, Sophie, and Jack. comfortable double sofa bed). It also comprises a bathroom with(shower and hairdryer) a modern self-contained kitchen. From the large living room you can enjoy a wonderful view on the sea and the well known Cinque Terre vineyards producing the rare and unique Sciacchetrà wine after which the apartment is named. There is also a nice terrace with a panoramic view on unforgettable riviera sunsets. Manarolavistamare managed 7 properties These prices only reffering to "STUDY SCIACCHETRA'" Reference prices for 2 persons: from € 120,00 / 200,00 per night Final Cleaning € 30,00 (The price depends on season and type of accommodation, for an accurate quote please contact us). Web Site is manarolavistamare.it The indicated price does not include the city tax (2 Euro per person per night for a maximum of 3 nights. Children under 10 year-old don't pay),which needs to be paid in cash on the arrival day.